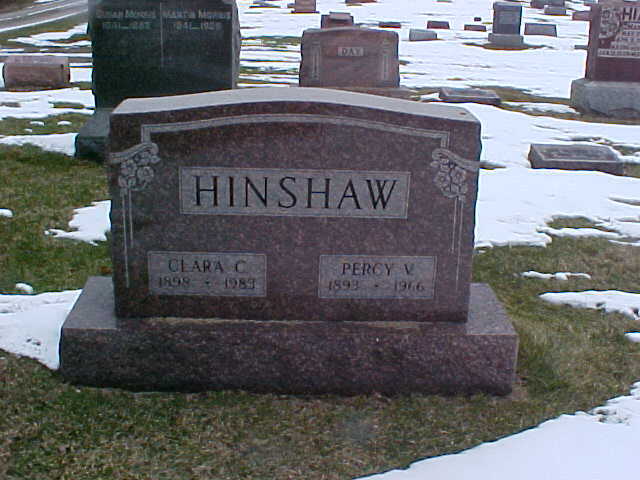 Hinshaw, Percy, head-of-household, age 26, born in Indiana; parents born in Indiana; rented home; occupation: farmer, general farm. Hinshaw, Clara, wife, age 21, born in Indiana; parents born in North Carolina. Hinshaw, Percy, head-of-household, age 46, born in Indiana; completed 1 year of high school; on Apr 1 1935 was living in the same house; owned farm ($2000 value); occupation: farmer, farm. Hinshaw, Clara, wife, age 41, born in Indiana; completed 8th grade; on Apr 1 1935 was living in the same house. Hinshaw, Denzel, daughter, age 18, born in Indiana; completed 3 years of high school; on Apr 1 1935 was living in the same house; attended school. WESTFIELD -- Percy V. Hinshaw, R1, Westfield, died last night in Riverview Hospital. A retired farmer and carpenter, Mr. Hinshaw had lived most of his life in the Westfield area. He was born in Hamilton County near Carmel, the son of Chester and Alphretta Davis Hinshaw. On October 15, 1919 he married Clara Cox, and she survives. He was a member of the Hortonville Friends Church. Surviving with his wife are one daughter, Mrs. Francil McKinzie [sic], Lexington, Kentucky, a granddaughter, Marcia Kay McKinzie, Lexington, Kentucky, one brother, John Hinshaw, Monticello, and two sisters, Mrs. Edith Seeright, Monticello, and Mrs. Edna Wiseman, Noblesville. 1940 census, Washington Township, Hamilton County, Indiana; roll T627-1050, ED 29-22, page 7A, line #25, household #161. 1920 census, Clay Township, Hamilton County, Indiana; roll T625-435, ED 93, page 5B, line #85, dwelling #125, family #125. Indiana Marriages, 1845-1920; http://www.ancestry.com (Book 15, page 261). 1920 census, Clay Township, Hamilton County, Indiana; roll T625-435, ED 93, page 5B, line #77, dwelling #122, family #122. 1940 census, Washington Township, Hamilton County, Indiana; roll T627-1050, ED 29-22, page 7A, line #17, household #159.